With the highest available flexibility, but as simple as possible. This makes life easier for users and for administrators. On the other hand we are opening our MedCubes Framework to App-Partners. They are using our core technology, API´s and templates to develop their own MedCubesApps. We are using all these features, tools and wizards in our own development teams. So we can tell you that we increased the productivity by 28% and we are still working on improvements to make faster. So we are delivering a stable foundation for developers that automatically covers all generally needed functions in Healthcare IT. To help developers to focus on their core knowledge and concentrate on their business logic. 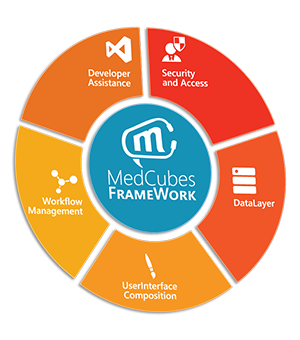 At last the MedCubes Framework contains an fully integrated Store. Here you find all MedCubesApps that are currently offered by our partners or us. As customer or consultant you can simply integrate these MedCubesApps into your desktops. Similar as you know it from mobile phones or tablets. But seamless integrated into the MedCubes solution. This allows you to scale the functionality of your MedCubes environment as you need it. Starting with a few MedCubesApps means lower training effort and lower costs. Then you add additional MedCubesApps when they can really support your users.